The department of Rhône is best characterized by a variety of landscapes and territorial riches. In the south-east, the region offers relaxation and mountain hiking. 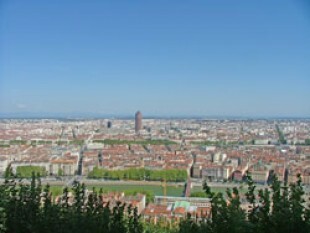 Above all, Lyon's historic site has been designated a Unesco World Heritage site. This is an important French tourist location where the world renowned wines of Beaujolais and the villages des pierres dorées (gilt-like stoned paved villages) draw an impressive number of visitors. Lyon is both a European metropolis and the capital of the Rhône region. It is the second largest city in France and, for the last several years, has become known for its strong emerging economy. Its geographical location (2 hours from Paris, 1 hour 30 from Marseille, 1 hour from Geneva) and its pleasant life style (1/2 hour from the countryside, 3 hours from the sea and 2 hours from the mountains) make Lyon especially attractive and contribute to its successful real estate market. Lyon is a cultural, commercial and intellectual city with the charm of the provinces. It is a city that, through its architecture, ambiance and location on the banks of two rivers, foretells the Midi of France. The subway, tramway and bus systems,, pedestrian walkways, bike paths and the famous "Vélo 'V" have made Lyon an active and environmentally responsible city with a good quality of life. You will be amazed by this ancient city and its traboules, or covered passageways, which have been listed as World Heritage by Unesco, la colline de Fourvière, and its basilica and Roman ruins, la presqu'île and its haughty, bourgeois architecture, la place des Terreaux is animated by a beautiful fountain by Bartholdi is located between City Hall and the Musee de Beaux Arts. The 1st arrondissement : Les terreaux, les Pentes de la Croix-Rousse, Opéra. The 2nd arrondissement: Les Cordeliers - Les Jacobins - Quartier d'Ainay - Bellecour - Perrache - Le Confluent. The 3rd arrondissement : Moncey - La Part-Dieu - La Villette - Montchat - Le Dauphiné. The 4th arrondissement : La Croix-Rousse - Quartier Serin St-Charles. The 5th arrondissement : Le Vieux-Lyon (Saint Paul, Saint Jean, Saint Georges) - Saint Just, Fourvière - Le Point-du-Jour - Ménival - Champvert - Saint Irénée. The 6th arrondissement : Brotteaux, Bellecombe, la Tête d'Or. The 7th arrondissement : la Mouche - la Guillotière - Jean-Macé - Gerland. The 8th arrondissement : Monplaisir - le Bachut - Mermoz - les Etats Unis - le Grand Trou - le Moulin à Vent - Laennec - Transvaal. The 9th arrondissement : Vaise - Industrie - Champvert - Gorge de Loup - La Duchère - Rochecardon - Saint Rambert - l'Île-Barbe. Thanks to a finely co-ordinated transport system (tramway, metro, bus) and numerous ways to access the centre of town, the real estate market on the periphery of Lyon is still as active as ever. Many of these communities are like villages with quality of life and green spaces. There are more single family homes here than in the city. Villeurbanne : which is still considered to be the "10th arrondissement" of Lyon, is the second largest city in the department. The cities north and west of Lyon are affluent communities. To the north, the communities of Fontaines sur Saône, Genay, Sathonay, Quincieux, Rillieux-la-Pape, Neuville sur Saône ou encore Caluire-et-Cuire offer wide diversity. There are new and period condominiums as well as a variety of single family homes to fit all budgets. To the west, the communities of de Chaponost, Charbonnières-les-bains, Craponne, Dardilly, Ecully, Francheville, Tassin-la-demi-Lune, Greyzieu, la Tour de Salvagny, l'Arbresle, Marcy l'Etoile, Millery, Vernaison, Charly, St Genis Laval, St Genis les Ollières, St Foy lès Lyon, Vourles, Orliénas, Limonest, Brignais,... are all sought for the quality of their homes, their serenity, charm and proximity to shopping areas. Les Monts d'Or is considered the 'choicest' area with a ringlet of pastoral communities such as Champagne, Saint-Didier, Saint-Cyr, Collonges, and Saint Romain. 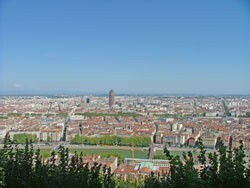 Lyon is surrounded by different areas and landscapes less than 30 kilometers from the centre of town. In the Northwest section of the city, the valley of Azergues winds through a wooded and undulating portion of the Rhône department. It extends to the vineyards of Beaujolais and its world renowned wines and to the villages des pierres dorées where Oingt, has been recently classified as the most beautiful village in France. To the southwest, To the southwest the foothills of the Massif Centrale mountain range appear. The Monts du Lyonnais (St martin-en-Haut, St Symphorien sur Coise, Yzeron, St Laurent de Chamousset), is also a wine producing region with sloping vineyards that continue up to Forez and the natural park of Pilat. The Rhône valley extends to southern Lyon where the vineyards of Côtes du Rhône begin between Lyon and Vienne. To the east of Lyon, the plain stretches to the Côtiére au Dauphiné to the northeast, and toward the towns of Crémieux, Pont-de-Chéruy and Bourgoin-Jallieu to the southeast. La Dombes, a plateau of a thousand ponds, begins at the gateways of Lyon and continues to the northeast of the Lyonnaise region. The Saône valley extends to the north of Lyon to the community of Villefranche-sur-Saône, bordered on the west by the summits of the monts d'Or (The Gold Mountains). The housing stock offers richness and diversity that make it possible to meet your requirements. "Côté campagne" with its village homes, corps de ferme, or renovated barns, its traditional stone homes, architectural villas with swimming pools, exceptional properties, housing estates, and luxurious contemporary homes, individual new generation bungalows and numerous high-quality environmental programmes. If you have already lived in Lyon or wish to move into this region in the near future, Côté Acheteur Lyon invites you to discover, or rediscover, this region with the express purpose of finding the home of your dreams.